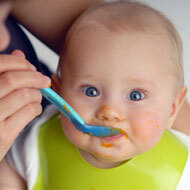 Baby feeding problems may arise if the child is not fed the right kind of food in the right kind of manner. Babies always require having their heads adequately supported whilst eating. 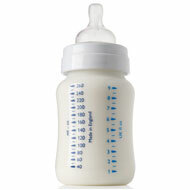 Additionally, it is also important to have the baby to burp, after every half ounce of formula that has been fed. This will help in preventing problems such as gas, regurgitation and choking. Do not feed your baby honey till he or she is at least a year old, as it is known to contain small quantities of botulism. How Much Milk Does A One-Year Old Need? When Should Toddler Vomiting Stop? What Are Baby Bottle Feeding Problems? An adult’s immune system is able to handle these small proportions of botulism easily. A baby’s developing immune system on the other hand, is unable to handle it, which can result in making it very sick. Use the right amount of formula; do not mix too much or too little. A large number of parents are of the opinion that an extra amount of formula powder will help the baby sleep soundly through the nigh. This is just a myth that does not hold any truth to it. An extra amount of formula powder may just result in making your baby sick. Once your baby is a year old, you can start feeding them cow’s milk. Whole milk is essential for a child as they need the calories and fat for proper development. You can start giving them low fat milk once they reach the age of two. Never feed your baby huge chunks of food, for the simple reason that they can choke on the same. All meat, vegetables, fruits and cheeses should always be chopped into small bits. You can also feed the baby citrus foods after he or she is a year old. Avoiding hard foods such as hard candies, dried fruits, seeds, nuts, raisins and popcorn is also recommended, as they are choking hazards. Sticky foods like jelly candies and marshmallows also have a tendency to get lodged in a child’s throat and hence must be avoided too. After a year the child can start eating on its own without any help. A lot of mothers use baby feeding schedules to decide on what to feed their baby and when. Similarly you could chart out a daily schedule for your child too. This will help in keeping a track of what needs to be fed to the child and when and in what quantity. In fact this will make the entire feeding process much easier to some extent.